Last Christmas I received a bottle of sherry from my sister-in-law who lives in Andalusia and who knows a thing or two about sherries. 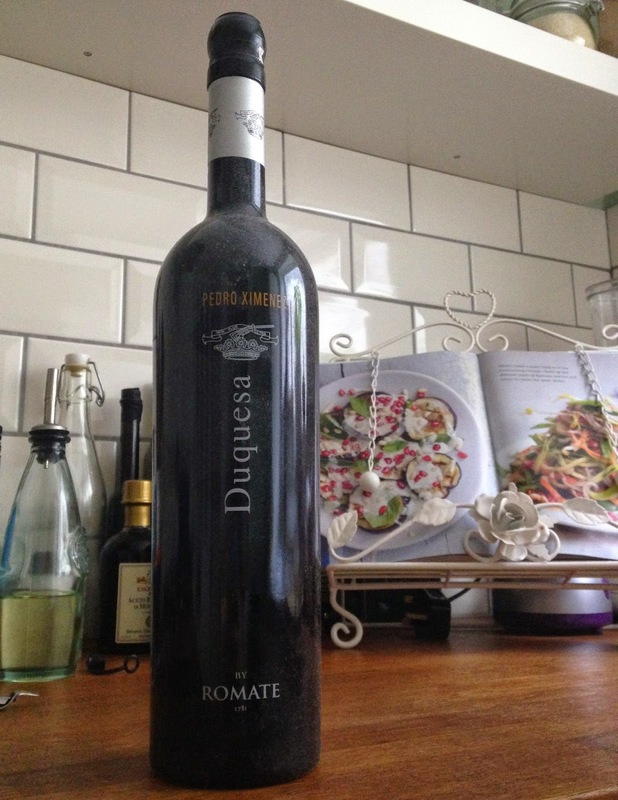 It was a Duquesa Pedro Ximenez Sherry from Romate, a Bodegas that was founded in Jerez in 1781. This style of sherry is made from Pedro Ximenez (PX) grapes and is at the sweetest end of the sherry flavour profile. It is a drink that I enjoy very much. I decided to open the bottle recently; it is a delicious sherry that spends over five years maturing in bottle before it reaches you. On tasting it you have a silky-smooth and warming mouth-feel and a taste that has that characteristic PX flavour of raisins. The trouble for me is that we were given a whole bottle of it - I can understand having a nice chilled glass of this on a warm summer's afternoon, or maybe after pudding on a cold winter's night; but knocking back a whole bottle seems a little much. I read up about PXs and found that unlike a Fino sherry they don't need to be finished within a day or two of opening and can last a little longer (upto about a month or so according to most sources I read). This being said I thought I would use this opportunity to get a little creative, why not try using this delicious sherry in some food? After all, it is a common adage that sherry needs to be matched with a food to bring out its best - surely in food would be good too? With this in mind I used last Sunday as an opportunity for a little culinary experimentation. Place a handful or two of plain flour in a bowl and add some salt and pepper. Add the braising steak and mix the beef around to make sure that all of the pieces have a good coating of flour. Place an oven-proof dish on the hob and heat a good slug of oil up nice and hot. Add the beef in batches and brown all of the pieces. Once the beef is done put it into a dish to sit for a while (importantly the dish will catch any juices that come out as you want to keep these). Add a touch more oil to the pan and then add the carrots and onions. After a couple of minutes add in the garlic (I always add the garlic slightly later to make sure that it doesn't burn). Once the vegetables have softened nicely throw the beef back in and then add a decent bunch of thyme, a couple of bay leaves, the PX and the wine (I don't use all PX in this recipe as it will be too sweet otherwise). Season. Bring the mixture up to a gentle boil and then turn off the hob. Put a lid on the dish and then transfer it to the oven to gently cook for about three hours. After two hours, get it out to check it - you might need to add a splash or two of water just to stop the sauce reducing too much. After three hours, the beef should be nice and tender and the sauce should be rich and deep and sticky. 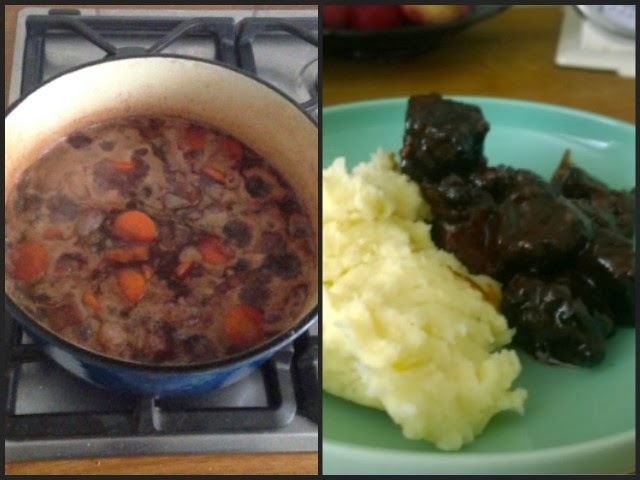 Serve with mashed potato for a good hearty meal. The PX does give a definite sweetness to this dish so you don't want an austere, dry red. Instead serve with a big, bold and fruity red - I think something Australian or South African would do the trick nicely here! This pudding is simplicity itself, I got the idea from a post I saw on The Wine Wankers' site. The name of the dish tells you everything that you need to know really. The result, although from a simple dish, is surprisingly satisfying. I would recommend that you chill the PX before drizzling it over the ice cream. 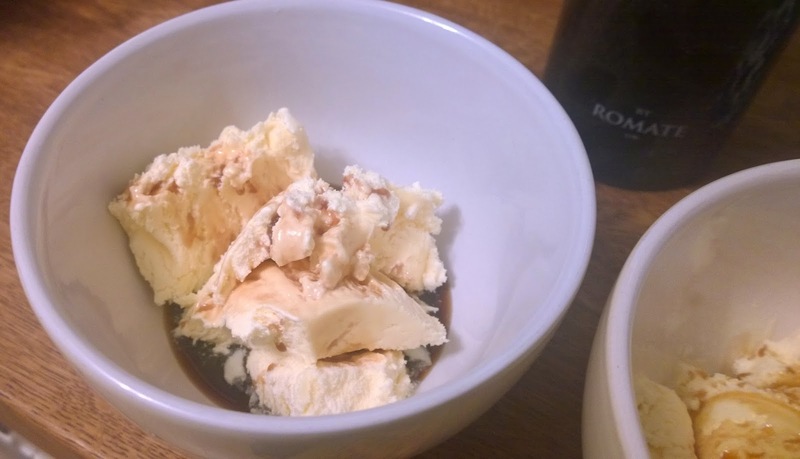 The booziness and sweetness from the PX really compliments the creaminess of the ice cream and transforms it into something glorious and decadent. I'm sure that there are many other desserts that one could make with this lovely bottle of PX (a take on a treacle sponge springs to mind) but this appealed to me as it was so simple and yet so effective. All that's left for me to do is thank my sister-in-law for the lovely Christmas present... Gracias, Diana! Yunnan Kitchen frozen burgers are generally frozen having a layer of paper among them to avoid them from sticking collectively. You could use metallic spatula or a butter knife to wedge included in this and obtain them aside. If you're having a mainly hard time getting the patties aside, you can permit the burgers take a seat out for a couple of minutes ahead of time than keeping apart them.